Aruba Malmok Villa Bon Bida. Oceanfront, quiet, safe and all private. Aruba Malmok Villa Bon Bida! Upscale beach villa with all of today’s comfort and amenities. Oceanfront, quiet and safe. Privacy and luxury in the exclusive residential beach area of Malmok, the finest residential area on the island. Less than two miles from most restaurants, casinos, hotels and American style supermarkets. Beside it’s beaches and the Tierra Del Sol Golf Course, this place is famous as the starting point for a real off road experience on the northeast side of the island. Make your trip by bike or 4X4 through the splendid nature of Aruba’s rocky coastline interrupted by white sandy “boca’s”. Bon Bida, papiamento for the good life! Living in style: Have your dinner on the seaside veranda with a beautiful sunset view or on the poolside patio in a romantic garden setting. Spend your happy hour under the seaside palapa or at the poolside palapa. The villa offers spacious living places, inside and outside. All rooms are fully air conditioned. The villa has been completely refurnished and redecorated recently. The style is very tropical with modern, most Indonesian style, furniture. All of which was found in the beautiful home decoration shops on the island. The villa is decorated with colorful paintings of local artists. Outdoor living: Aruba’s famous coast is just in front of the villa and the ocean is ideal for swimming, snorkeling and diving. Other popular sport activities include windsurfing, kite-surfing and sailing. The villa is next to the Golf Course of the Tierra Del Sol Country Club, which houses our favorite hill-top restaurant: Ventanas Del Mar, with its gorgeous views. Do not forget to enjoy the Spa! Amazing beach vacation with friends at Malmok Villa Bon Bida!! Spacious and had everything we needed. We stayed at this property March 2-9, 2019 with four couples total. It was a great home that had all the amenities we could have asked for and more. The bedrooms were spacious and each couple had their own bathroom. The kitchen was well stocked with every appliance and dishes we needed. The pool was cleaned a couple times a week and the outdoor space was ample with lots of areas with shade and sun. The home also has an indoor and outdoor speaker that we could hook our music up to and enjoy all our playlists. The beach across the street is not swim-able but just a short walk down the road is Arashi Beach where they have great swimming and a cute little beach shack with reasonably priced drinks and food. The shrimp is amazing! I would recommend this property to anyone looking for a place that gives guests the privacy they may want, yet a nice open floor plan for hanging out with your group. We had a great time. Love the house and convenient location. Hope to come back soon. We are a group of four couples that go somewhere new in the Carribean each year. This place was AMAZING. We thoroughly enjoyed every minute of our stay here. We had a few dinners at "home" in the evenings and the ambiance was unmatched by any restaurant on the island. Steak and fish on the grill. The villa had everything we could have wanted. I wish I could add a picture of the candlelit table. We were away from all the noise of the resorts, but close enough to anything we wanted to do. Love love love this place and would come back again in a heartbeat! The property was gorgeous! Beautiful home .... we thoroughly enjoyed our stay. 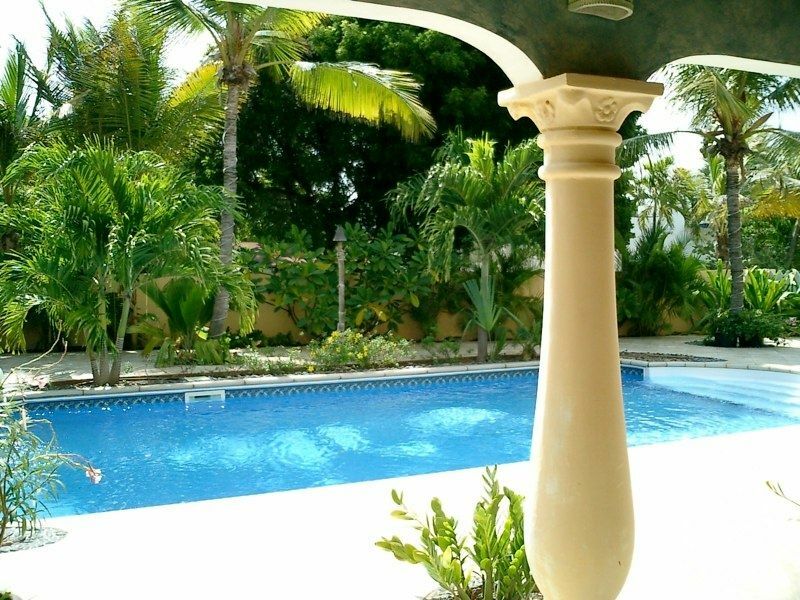 Well maintained property with so many comfortable areas ( both inside and out ) to relax and enjoy the beauty of Aruba. Perfect walking distance from the beach with view of the sunset. Would definitely recommend this property ! It has all you need for a wonderful vacation. UPON ARRIVAL, WE KNEW IT WAS THE PERFECT VACATION HOUSE FOR OUR GROUP OF 8. PLENTY OF SPACE AND PRIVACY, BEDROOMS WERE SPREAD OUT THROUGHOUT THE HOUSE. THE POOL WAS AWESOME, LOVED ALL THE OUTSIDE SITTING AREAS AND BEAUTIFUL LANDSCAPING. KITCHEN WAS PLENTY SPACIOUS TO COOK OUR MEALS. CLOSE ENOUGH TO SEE THE BEAUTIFUL WATERS. I WOULD HIGHLY RECOMMEND THIS PROPERTY. IT MET ALL OUR EXPECTATIONS AND MORE!! Aruba is one of the most temperate islands in the Caribbean. Constantly moderated by trade winds from the Atlantic Ocean, Aruba has an average daytime temperature of 82° Fahrenheit (27° Celsius), with the difference between median day and night temperatures, and between summer and winter temperatures just 3.6°. Aruba is an island of contrasting terrain. The southeast has the white sand beaches, turquoise seas, and warm waters. Aruba has an arid, almost desert like interior. The northwest coast, exposed to the Atlantic, has a few white sand beaches, rough seas and a rocky coastline. In Aruba you will see wind-bent divi-divi trees, many different varieties of cacti, and unique rock formations.